Courtesy PhotoPinkerton sophomore Isabella Scarpetti shows her form while practicing a floor routine. Courtesy photoPinkerton sophomore Isabella Scarpetti, a Level 9 gymnast, is focused while airborne. She’s probably one of the most talented gymnasts in all of New England. As a Pinkerton sophomore, she’s a Level 9 gymnast well on her way to being classified Level 10. She’s talented in every routine, but particularly on the beam. With a 9.775 score, she’s the No. 2-ranked Level 9 performer in the nation. She’s the leading scorer on a powerhouse 15-0 squad who led the Astros to a record-breaking 145.00 performance against Bishop Guertin, which was nearly three points higher than any score posted in the last 10 years. She has won countless individual events and was the all-around champ in three of four meets, falling to second in one meet when she slipped on the beam. Her name is Isabella Scarpetti. Haven’t heard of her? That’s not surprising because, outside of the gymnastics community, few people have, for a couple of reasons. Scarpetti’s relative anonymity, even within the hallways of Pinkerton, is understandable. The Hooksett resident has been home schooled by her mother her entire life, and this is the first year she’s competed for the Astros. And there is something else. Scarpetti, who trained and competed briefly in Florida when her father was involved in a construction project there, is not one to brag. Burland knows Scarpetti as well as anyone because she trains her at the New Hampshire Academy Artistics Gymnastics in North Hampton, and the Pinkerton coach is thrilled she decided to compete for the Astros this year. As a home schooler, it gives her another opportunity to train and compete, which she thrives on. In fact, one of the reasons Scarpetti enjoys being home schooled is that it affords her more time to train, which she does at least 22 hours a week at the New Hampshire Academy. The 5-foot-3 Scarpetti has always been energetic, according to her mother Jackie, which is how she became involved in gymnastics at a young age. But Scarpetti, who scored in the 96 percentile of the math section of the PSATs, has continued with piano lessons and practices about an hour per day. In competition, she has scored Superior (the highest level) in solos eight straight years. 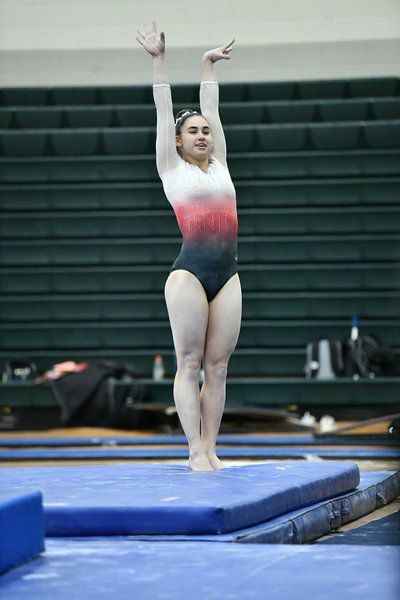 With that drive, Scarpetti has two goals — to reach Level 10 as soon as she can and then to compete in college gymnastics, preferably in Division 1. Burland, who has coached her share of top gymnasts, has no doubt that Scarpetti will reach her goals. Which means that Scarpetti will be far well known in the very near future.